Bourne is looking very much like the focal point of the Buzzards Bay Blizzard, which may become "the Barnstable Blizzard" or the "Cape Cod Clipper" (which is inappropriate, as this is more of a classic Nor'easter than an Alberta Clipper-type storm, but it sounds good). We've also been kicking around "Cape Cod Crippler," "Snowbeast," "Plymouth Powder Pounding," "New Year's Nuisance,"and "South Shore Smackdown." We don't put any stock into the very lame Weather Channel names for storms (this one is "Hercules," according to them), and very much prefer that storms be named by the people who suffer through them. We also feel that if no other media follows TWC's lead and uses their names, it creates confusion. TWC should just stop with that nonsense. * We had light snow overnight in Bourne, and picked up a solid inch of powdery snow. You can clear your windshield this morning by blowing at it like you do with birthday candles. * As of now and generally for most of the daylight, this is one of those "north of the Mass Pike" storms. The snow that will bury us is currently a block of rain off the Confederate coast. It will make it here tonight, and will be the most instense snow anywhere for this storm. * Reporters began dropping the B Word yesterday, and we'll be in that territory overnight. Travel anywhere in our coverage area after dark is Foolhardy. * A blizzard requires 35 mph winds for 3 hours at least, 1/4 mile visibility and blowing snow. 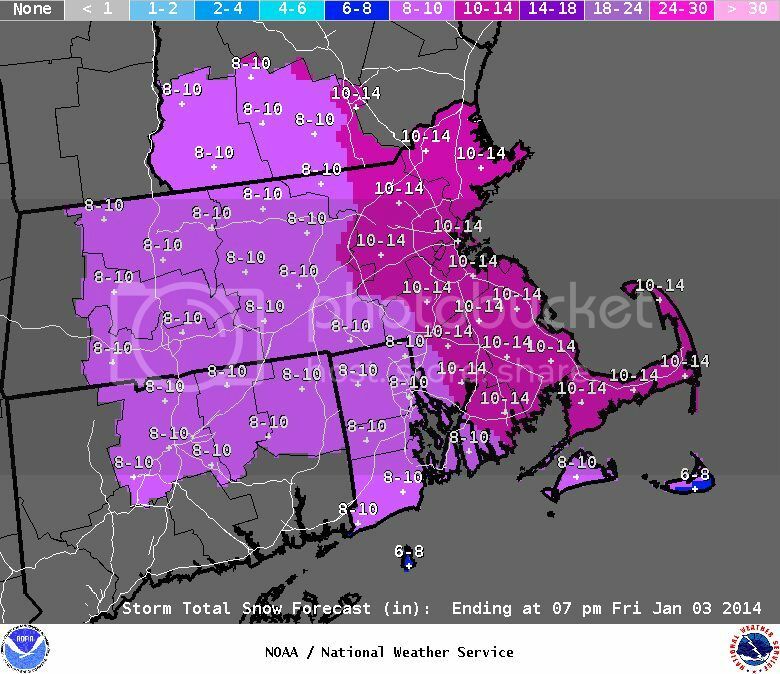 - NECN: 14-18", with someone very close to us possibly reaching 2 feet. * Parents around town are furious or pleased over the fact that most of Bourne has school today. Tomorrow looks like a sure Snow Day, and- if I'm wrong about that Mass Pike focus during today's precipitation- the kids can even be coming home early today. Remember, even if they go in at 9 AM and are on a bus home at 11AM, it doesn't count as a snow day, and doesn't need to be made up in June. * Parents who don't care about an extra day in June note that Upper Cape Regional Voc-Tech saw fit to cancel classes today, while Bourne High School did not. UCT is about a really long punt from Bourne High School. * I just called to verify, and the Bourne Police currently have no plans for opening a shelter. If the power goes out (and it went out last year, in a similar blizzard) and you have no heat for 3 days, you'll have nowhere to go. Temperatures for Friday night are forecast to be in the negative single digits, i.e. 1 degree below zero. * Bourne is currently under a series of advisories from the National Weather Service, including Blizzard Warning, a Coastal Flood Warning, and a Gale Warning. * The coastal flooding will spare us at today's noon-ish high tide, but it will be in full gear during the overnight high tide at the height of the blizzard. Friday's noon tide will also be threatening, although the wind may be blowing offshore by that time. We just had a New Moon on January 1st (Editor's Note: We're hearing reports of minor flooding off Gurnet Road on Duxbury Beach). * The snow will intensify after dark, and Friday morning's commute should be a nightmare. Cape Cod will be the last location to have snow falling, and outer Cape Cod may be seeing snow fall with their supper Friday night. * According to the State Police, the Bourne and Sagamore Bridges will generally close only if winds near 70 mph. They do have the ability to close them if ice builds up or if it snows too hard/too fast. This column would be very shocked if either bridge closed during the storm. * After the snow finishes with us, we get the polar air mass. Low temperatures will be below Zero Friday night, which will be enjoyable if you have no electricity. *We'll be back later with an update.